Res Ipsa Knit With Her: So what's with all the socks? I'm a newbie to having a blog but I have been surfing the knitting blogs for about six months now. I'm sure there is a direct correlation between my discovery of knitting blogs and a drop of productivity at work! I started with the Yarn Harlot and went from there. One of these days when I can figure out how I'll post a sidebar with the blogs I read. Anyway - my question is - WHAT'S WITH ALL THE SOCKS???? Almost every blog I read the knitter is knitting socks! What's the appeal? What's the deal? Socks are knit on itty bitty teenie tiny needles, you have to use those tricky double pointed ones and hope that you don't loose stitches and in the end you have - a pair of knitted socks. Now maybe it's because I'm a California girl and almost never wear socks - even in the dead of winter. Maybe it's because my calves are big and I worry about socks not staying up. But why is it that everyone is knitting socks? Are they super comfortable? Is it because they are hoping to knit a sock that has the personality of the Harlot's traveling sock? Is it just because everyone is doing it? Something is afoot here. They do look fun. The patterns are cool. The jaywalker has certainly swept the world (assuming the entire world consists of knitting blogs but I think that's a safe assumption). But I just don't get it. 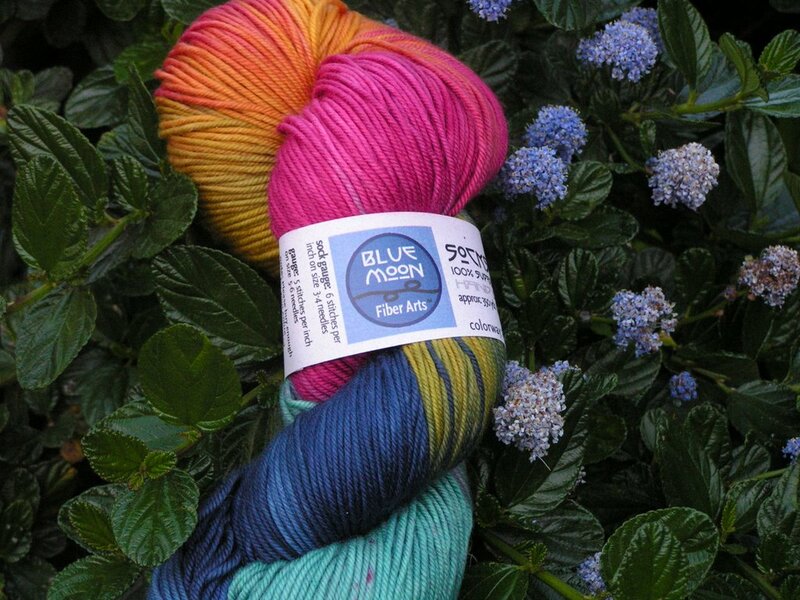 I must say thought that I am feeling the pull - I keep hearing about this wonderul "Socks that Rock" yarn and so when I was at Stitches West and I saw the Blue Moon booth I was inexplicable sucked in AND bought a skein of yarn! "What is that?" my Mom asked. "It's this Socks that Rock yarn that I keep reading about," I said. "Are you going to knit some socks?" she asked. "No, I said - it's just that I keep reading about it and wanted to know what all the fuss is," said I. "Hmmmm" she said -"what will you make with it?" And there remains the question. Will she or won't she? Will she be sucked in to the sock craze or maybe find a cool scarf pattern to use the Socks that Rock yarn with. Can you make a Scarf that Rocks with Socks that Rock or will you find yourself constantly tempted to wrap it around your feet? Stay tuned as I continue my quest to find the answer to the mystery of the cosmos. I am so with you on the sock fetish. I have never before knitted a pair, but I find myself now looking at sock patterns and wondering what all the fuss is about. Fill me in when you find out! Kish and I may be in trouoble - we may be led down the purly sock lane by Plumpy! What is this mystical magic loop? You started a blog!! how fun!! I have made one pair of socks, almost finished a second pair and made a pair of fuzzy feet. i would like to try the magic loop method next. Everyone says it's easy and I don't like the little ladders I get using double pointed needles. That sock yarn is gorgeous! The magic loop is wonderful! I had learned it a few months ago. The other day I taught myself the two circular needle method. I almost like it better than magic loop. Does this mean I have to start socks now?? :) Someone send a good pattern my way.